Freeze Vegetables and Taste Summer All Year Long. You can freeze vegetables while they are in season and at the peak of freshness to preserve nature's bounty. Bulk freezing of veggies, particularly home grown or local veggies can keep your grocery costs reasonable all year while your family enjoys out of season produce. They are great for side dishes, soups, casseroles and other recipes where the veggies are cooked but can not be used in place of fresh vegetables in dishes like salads. For best results and best nutrients you should freeze freshly picked ripe vegetables. Veggies should ideally be picked and frozen on the same day. Prepare veggies for blanching by removing any over or under ripe pieces. Most vegetables have enzymes. Enzymes are what makes vegetables ripen, but if the enzymes are not stopped they also cause the vegetables to rot. Vegetables without enzymes present like rutabagas, leek and bell peppers do not have to be blanching before freezing. Blanching can be done by steam or in water. Microwave blanching gives inconsistent results. Count the time for water blanching when the water returns to a boil. Count the time for steam blanching from the moment the lid goes on. Use a timer, don’t guess. Local extension offices are a great resource and has recommend times for blanching vegetables before freezing, approximate yields of frozen veggies from fresh and cooking times for frozen vegetables. Shocking the veggies in ice water serves the purpose of cooling them, preventing them from cooking longer. If the veggies are cooked too long they can lose their crispiness or fresh flavor. As a general rule cool vegetables for the same amount of time as you blanched them. To test cut a veggie in half and feel the center to see if it is cool. Having enough ice on hand can make this faster. You can freeze small bowls or pans of water ahead. Glass pans like loaf pans are great for this. I also recommend a very large bowl or bucket for cooling, since the sink might be needed for other things. I put my veggies in the strainer over the sink for a minute or two and then pat dry with a towel or paper towels. Veggies can be flash frozen on cookie sheets, just until solid. 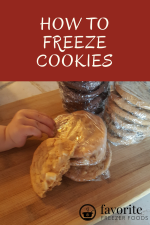 To flash freeze simply put the veggies on the cookie sheet in one layer so they are not touching or are easy to pull apart and freeze just until solid. Smaller pieces freeze faster so check after 30 minutes and every 10-15 minutes after that. Then place flash frozen veggies in a large freezer bag and you can pour out as many as you need at any time. Or vegetables can be frozen in plastic bags or containers in sizes your family can use in one meal. Put veggies in the bag and place directly in the freezer. For best results you want to freeze vegetables fast. Faster freezing means smaller ice crystals which means less damage to the cells of the vegetables. Do not stack your vegetable packs until after they are frozen. The ones in the middle will take much longer to freeze. Also freezing the bag flat on it’s side makes it easier to stack later and thus takes less freezer space. Label with the type of vegetable, how long it was blanched and the date. For example Asparagus 3/5/09 blanched 3 minutes. I use a permanent marker on my freezer bags for this. Frozen vegetables, properly blanched and packaged for the freezer can be stored for 8-12 months. 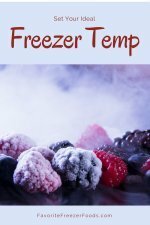 Do not thaw frozen vegetables, cook from their frozen state. Learn more about frozen vegetables and find frozen vegetable recipes.